Mainly referred to as aeola, the name given by Kirby in 1852, this species had already been named coturnix by Burmeister in 1835. Most 20th Century literature on this widespread species refers to coturnix as aeola. 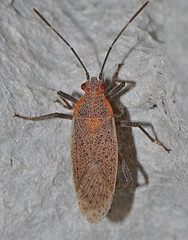 Physical description: About 8 to 13 mm in length. Variable size and color; dorsal side is typically brown with numerous dark spots. Head and sides of pronotum are red. Spots often arrange as vertical lines, usually down the middle of the head. Spots often larger on the veins of the hemelytra as well as areas of the membrane. Appendages are brown. May resemble: J. sanguinolenta (head broader than coturnix), J. bayardae (ocelli much further apart), J. harrisi (finer spotting of corium; ochre extremities), J. similaris (wider head, sides of pronotum less angled), and J. silbergliedi. Physical description: About 9 to 11 mm in length. Typically red with spots that are mostly smaller than those of aeola; larger spots are only found on the veins of the hemelytra. Head and extremeties are brown. Ventral side is red. J. coturnix has been found in Texas and Jamaica, but the exact locations of where it was collected are not known. Henry, T.J. and Froeschner, R.C., eds. (1988) Catalog of the Heteroptera. New York: Brill Academic Publishers.